Updating your bathroom doesn’t get any easier – or more affordable. There’s no need to hire a contractor – you can install this bathtub screen yourself! Unlike a bulky shower curtain, the Rena-style (rounded corner) bathtub shower screen door lets in plenty of light. 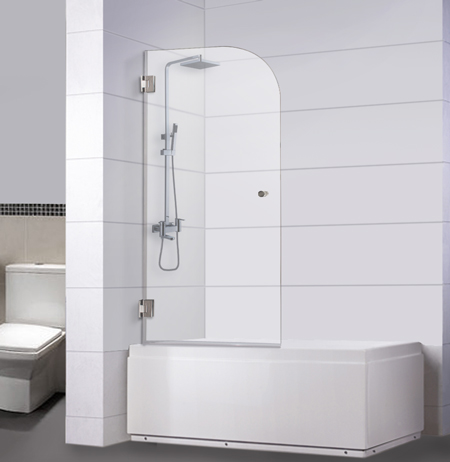 The pivoting door won’t get in the way of using or cleaning the tub. And unlike a sliding door, the trackless bottom just wipes clean – no scrubbing! So attractive and easy to clean, you’ll never miss your old shower curtain. An affordable price and do-it-yourself installation make it the perfect choice for those updating a bath on a budget. Best of all, it won’t even look like you were on a budget – the sleek styling brings an upscale look to any bathroom for a fraction of the cost. The Rena bathtub glass screen features a pivoting door. Sturdy metal door knob comes in chrome finish.